A view of the Valsamata region from the mountains. Valsamata is the main centre of the Omala valley (valley of the 40 wells). Many earthquake ruined buildings still survive in old Valsamata, whilst the new town has been built about 1 Kilometre away. Here you will find the usual tavernas and bars as well as a supermarket. The main reason most people come to the valley is to visit the monastery of Agios or Saint Gerasimos. It is dedicated to the islands patron saint. He was born in Corinth and founded the monastery in the 16th century after spending twelve years in the Holy Land. Saint Gerasimos spent the rest of his life until he died in 1579 looking after the villagers. He was declared a Saint in 1622 after it was discovered that his body had not decomposed. His body now rests in a silver coffin in the chapel. Every year on the 16th August and 20th October a procession takes place and the Saints coffin is carried to a tree he once planted. Many miracles were attributed to him and he was famous for his miraculous curing powers of mental illness. 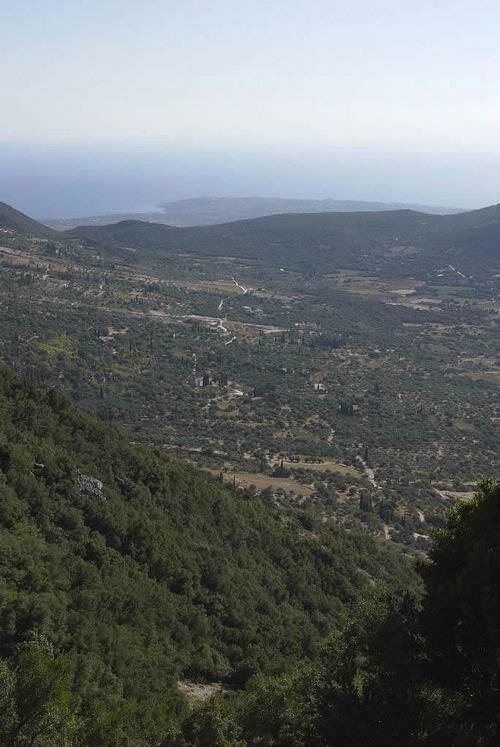 The Omala valley is also famous for its wines and the Robola of Kefalonia is renowned.